2 Dinner time has arrived. The devil had already incited Judas Iscariot, son of Simon, to betray Jesus. 3 Jesus knew that the Father had put all things under his control, and that he had left God and was coming back to him; 4 So he got up from the table, took off his cloak and tied a towel around his waist. 5 Then he poured water into a bowl and began to wash the disciples' feet and dry them with the towel that he wore around his waist. -And you, Lord, are you going to wash my feet? 7 "Now you do not understand what I'm doing," Jesus replied, "but you'll understand later. 8 "No!" Protested Pedro. You will never wash my feet! -If I do not wash them, * you will not have part with me. 9 -Then, Lord, not only the feet but also the hands and the head! 10 "He who has already bathed does not need to wash more than his feet," Jesus replied. for all his body is clean. And you are already clean, although not all. 11 Jesus knew who was going to betray him, and that is why he said that not everyone was clean. -Do you understand what I've done with you? 13 You call me Master and Lord, and they say well, because I am. 14 For if I, the Lord and the Teacher, have washed your feet, you also ought to wash one another's feet. 15 I have set an example for you, so that you may do the same thing that I have done for you. 16 I assure you that no servant is more than his master, and no messenger is more than the one who sent him. 17 Do you understand this? Happy are they if they put it into practice. Jesus washed the feet of his disciples to give them a test of the great love he had for them. He loved them to the end. John 15:13. Nobody has greater love than this. He loved them, he gave them freedom to ask him; He had a lot of patience, he rebuked them, but he never stopped loving them ... and in several ways he showed them the care he had of them. Jesus washed the feet of his disciples to show the whole world how willing he was to love them that he did not mind humiliating himself. "He got up from dinner"
"He began to wash the disciples' feet"
People do not do certain jobs or do not go to certain places because they are not of their category. They believe they lose power, position, reputation if they do this or that. Jesus knew that his position came from God and God goes. Whatever he did regardless of the category or nature of things, he would not take Jesus' position. We must serve others without thinking that he will lose something, or that he will make a fool of himself or that he will be left in shame. On the contrary, the believer must follow the example of Jesus and demonstrate by his good service and goodwill that he is willing to do everything to serve his neighbor to raise the name of his Master. Jesus washed the feet of his disciples to imply the spiritual purification of his soul, the contamination of sin. It is necessary to be spiritually ready to serve others physically, if not everything becomes "activism", which, carried by pride, culminates in the exaltation of the helper rather than the helped one. What should make the difference in our help is, clearly deliver that help that does not end; the Salvation. Something I like about the Pan del Cielo project is that it goes beyond simply helping, the essence of the project created by the apostle @ Darlenys is more than providing a food for children is to plant the word of God in them so that even when be old do not turn away from God, that is the beautiful part and what really vivifies this great project, the power to serve God helping to sow the word in the relay of our generation. Jesus took the time to explain what he has just done and asks them "Do you know what I have done to you? If he is Lord of our lives, we must surrender our obedience to Him. They had to wait for Jesus to finish washing everyone's feet before he explained why he did it. He proved their patience and ability to be still and wait for Jesus to finish his work. Jesus was teaching to see God work. Even if we do not understand what God does and why, we must do what HE does or commands us to do. For something is THE LORD of our lives. What counts is obedience, not intelligence. Beloved church let us not be out of focus of the true vision, one of the purposes for which you were created and you were called to this path is to serve God with all your heart and with the best disposition of your life, with dedication and with passion for the souls , that no soul be lost but that each one proceed to repentance. 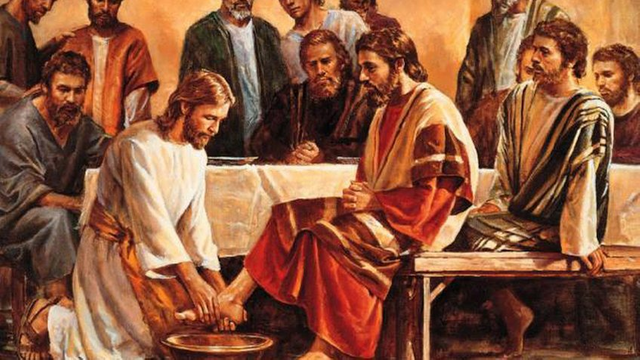 @mariela, when Jesus took the towel and the basin to wash his feet to his disciples, not only assumed the humble role of the servant, but also showed psychological security, essential in a leader. The lifestyle and lessons of Jesus establish the model for a new class of the leader: the servant-leader. Very good reflection. God bless you. I humbly submit my comment.